The Nokia 7200 is the company's first real attempt at a clamshell camera phone, and is a very welcome addition to the Nokia lineup. Clamshell phones tend to be pretty much identical looking silver things, but Nokia has been having a funny turn recently (see the Nokia 7600) and the Nokia 7200 is no exception, featuring fabric covers which is definitely a first as far as we know. The Nokia 7200 measures 86x50x26mm and weighs 115 grams. Battery life is 2-5 hours talktime and 6-12 days standby. The Nokia 7200 comes with optional Style Packs with X-presson textile covers, pouch, screensaver and wallpaper. Internal display is 128x128 pixels plus a small external monochrome display with 96x36 pixels, which is not quite as good as some of the competition, however the Nokia 7200 includes a built in speakerphone and FM radio which is very impressive in such a small unit. Connectivity is good.. it's a dual-band phone supporting GPRS, HSCSD and EDGE. It has an infra-red port but no Bluetooth. 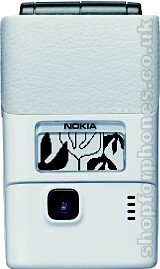 The Nokia 7200 is available to order now on O2 and Vodafone contracts. If you're interested in other networks or Pay-As-You-Go, please subscribe to our newsletter. If you want more information on the Nokia 7200, subscribe to our mailing list. Also, the Update newsletter contains general news about new phone releases.